There are not many dishes as desirable on a hot summer afternoon as a well chilled gazpacho. This particular one stands out as one of my first culinary memories in this country. It was about twelve years ago, when I wasn’t very familiar with any other types of cooking other than Russian. 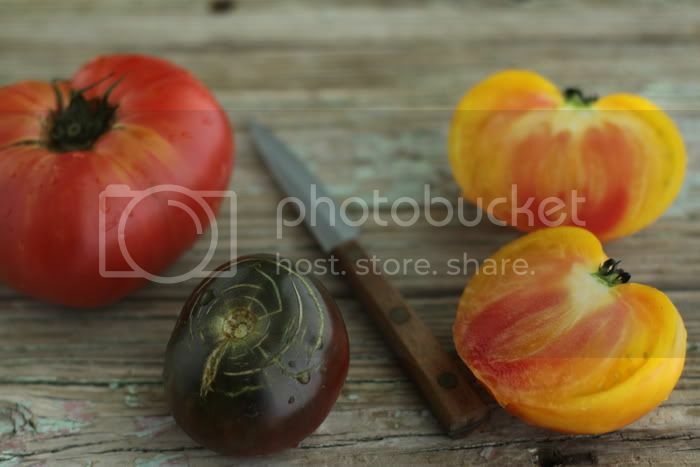 I tasted a smooth and well spiced tomato soup with an unexpected pop of perfectly sweet, cold and juicy watermelon pieces right in the middle of it all. That gazpacho left a long lasting impression. That’s what one ought to eat in the summer, I thought. Since then, I’ve discovered and tried many gazpacho recipes. Some were good, some – not so much, but none were ever as tasty and refreshing as that first gazpacho. Finally, years later, I decided that it was time to recreate that dream of a soup. Before, I’ve tried making a watermelon-based gazpacho, but didn’t much agree with the way the watermelon behaved once pureed. 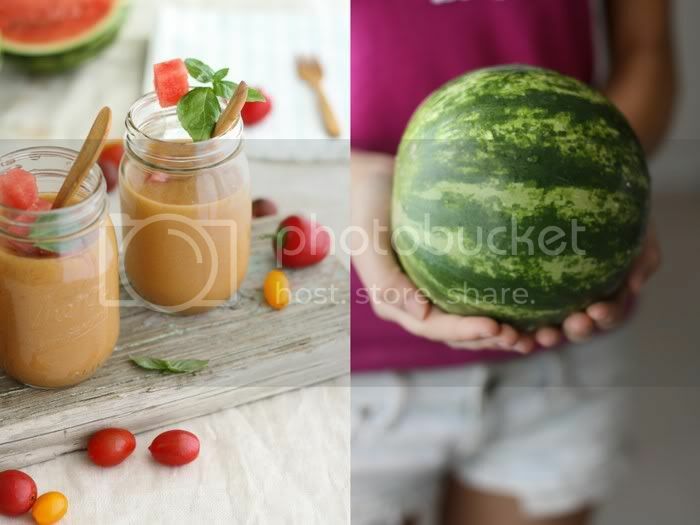 I realized that the success of this dream soup was in its smooth tomato base, while the watermelon is present only in pieces, which surprise with additional bursts of chilled sweetness on your tongue. After all these years, it’s hard to say how much my soup resembles the original one, but it’s safe to say that we enjoyed it just as much. In a high speed blender, combine all of the ingredients, with the exception of watermelon, until smooth. You may need to do it in two batches. Optionally, pass through a fine strainer to achieve a very smooth texture. Adjust the salt and pepper and chill well. Serve with watermelon pieces and fresh basil leaves. sounds delicious, and i love the idea of serving it in jars. so cute! I’ve always enjoyed Gazpacho, but never would have thought to include watermelon with tomatoes…what an awesome combination! I’m a new visitor to your blog and find it to be one of the most original and inspiring out there. Great photography, too. By the way, is that a Dexter-Russell paring knife I see? If so, great choice on your cutlery, as Dexter knives are the best value for the money out there. Also, they’re made in the USA? I’ll be back for your next entry. I really like your composition in these photos. I have never heard of putting watermelon in gazpacho. At a mexican market the other day, though, they sprinkled powdered spices on cold chunks of watermelon. I am getting more and more intrigued! Yum! I love the spoons, too. It’s definitely gazpacho season here in San Diego. Hot hot hot. It looks so refreshing and delicious, I can’t wait to try this one. I actually was craving for gazpacho, so your post came right on time, thank you! My first time here but I love what I see! 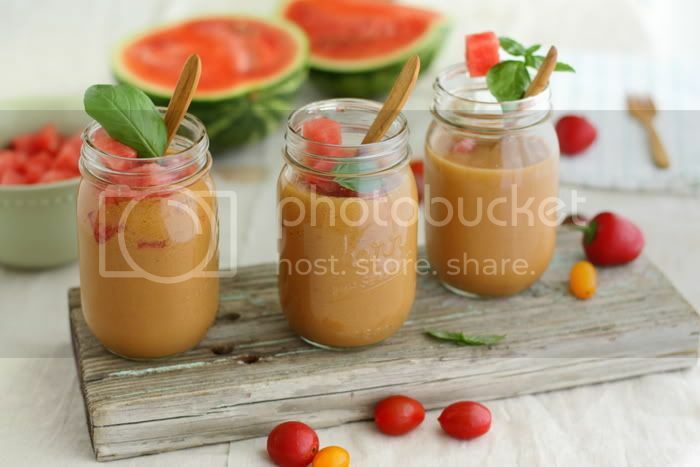 Great idea to pair watermelon with gazpacho as it sounds (and looks) delicious..
Hi! I like your pictures and the idea of little bits of watermelon. I just made a gazpacho as well. It was my first try, but it turned out nicely. Come over to my blog and take a look ! First time on your blog too, but love it! Will have to try this recipe as it looks incredible! Bookmarking this, for sure! Beautiful pictures. Looks creamy and delicious! And I have seen watermelon based gazpacho’s before but using tomato as the base sounds better to me ;) YUM! I love gazpacho and I have never had it with watermelon, how unique! Thank you for the inspiration! Oooh La La this sounds divine! Great shots once again:) Thank you kindly for adding us to your blogroll if I haven’t already done so-I’m losing my everlasting mind!! Wow! this looks beautiful and delicious. 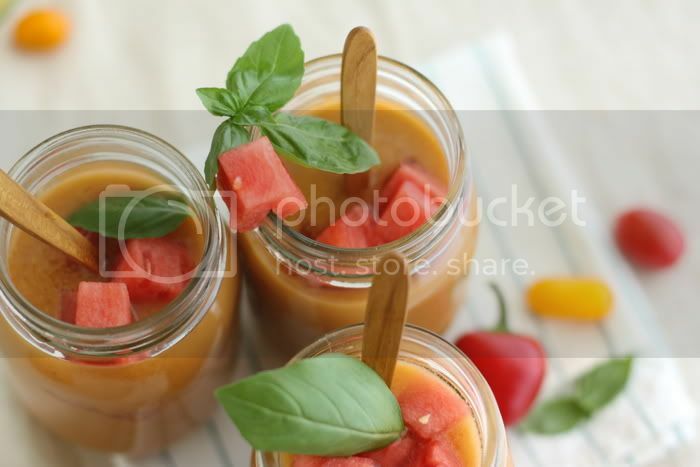 I have just made a watermelon and tomatoe Gazpacho. It was good but you are correct when you said the base is not smooth..Thanks for letting me know the difference in the base,Yours is definitely superior for the texture and the tast. Your recipes get better and better! Just continue with all for it is LOVE that makes the blender go round!! I can’t believe it’s taken me a year [on my raw food journey] to find you. Never mind that we’re on separate continents – that’s irrelevant these days. This recipe (all your recipes) look and sound delightful. And I like your suggestion about leaving the watermelon in chunks. I’m anxious to try this and several others. 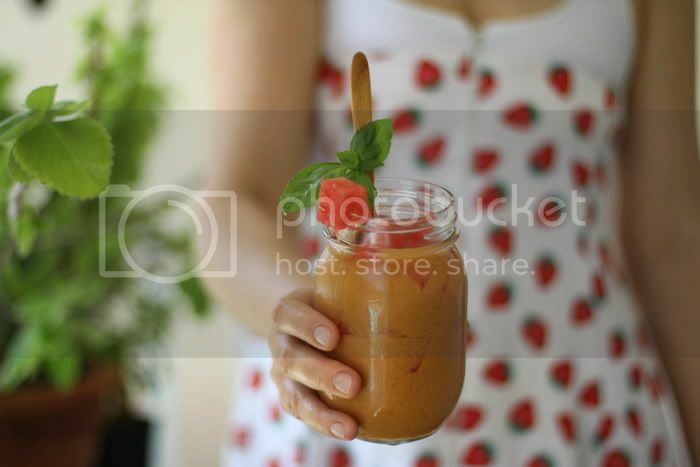 You inspire me and I will strive to meet the bar you’ve set with my own raw recipe site and photos. Thank you. Looks great. We just shared this on our Facebook wall. Thanks so much for your input, everyone! Sara, thank you. We loved eating it out of jars. Great for a picnic. Knife Man, yes, Dexter! Best knives ever, cannot use any other knives. Kelsey, thank you. You noticed the spoons, they are new :) We like them quite a lot too. Andre, that means so much, thank you. Styling is one of our favourite parts. Fawn, nice to meet you and thanks so much for the sweet comment. Blendtec, thank you. We love your blender and use it several times a day, every day. Great recipe, ladies. Thank you – I borrowed it for my site. Love the entire blog, especially the photography. Love this so much! Thanks for sharing…. Your blog and your photos are absolutely stunning! I’m so glad Mint wrote about this delicious-looking soup and that I clicked over! Even your title “food that takes love” makes me want to stay and look around. Your Paris photos, too have got me yearning to go back to Paris. I love your blog! TY!!!! Are you willing to share source of spoon in gazpacho? love your blog…would you share the spoon source…TY!